Any guesses on how red, light, or dark he will be as an adult? Here is our new pup at age 4 weeks. He will be the one on the right or the one on the left ... we don't know which yet. I have looked at many of your photos going from puppy to adult to try and get an idea of how much dark the puppies will retain. I just don't have a feel for how much dark will be part of the adult. I am guessing that the lighter pup (on the right) will turn out to be a light orange? The pup on the left will be a deeper red or sesame?? Any guesses from you experienced Shiba owners?? Ok...I'll play!! The one on the left looks a lot like Kobe did at four weeks and Kobe is sesame. The one on the right looks more like a red, but Kobe's brother had a very light head and turned out to be sesame as well. Wish you could see more of the lighter ones back, but I'll still go with red. If you really wanna know just ask the breeder, but yes this is more fun!! Either way don't think you can go wrong....cute youngsters!! @Orangedoggie...what do you consider a "true" sesame?? Some have more of the dark guard hairs, some less. Are the ones with less not Sesame? What would you call them then? Not picking a fight, just interested in your opinion!! Here's one I took picture myself. There are different sesame colorings. Red sesame is more lighter and the harder to breed for sesame looks bit more different. Not sure on how coloration will be pups change as they grow especially when they get their adult coats in.. Cute puppies either way. I sort of dig Tatonka's tri-coloring. He's a year old. It will likely lighten up, leaving just red and white. 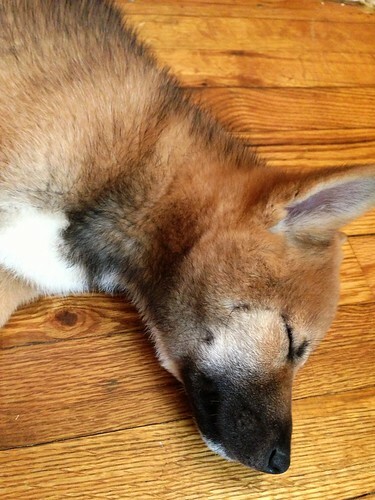 It is usually hard to say for sure for sure how a puppy's coloring will turn out if they have that black around their nose and on their backs, because that could easily fade into a darker red color to produce a well-rounded red Shiba, and the nose could easily fade into a white color to blend with the chest. Or, haha, they could turn out to be a sesame! I think that Maggie looks very similar to the batch of pups you are considering! Her mom was a sesame and her dad was a beautiful, brilliant red. I am posting some pictures and descriptions of her color change over the past 10 months so you can kind of have a better idea at what exactly I mean by the color "fading." Maggie is now 10 months old and most of that fading in the previous picture is no longer there. There's a little hint of it, but it continues to fade, and I have honestly no doubt that once she's a little older, it won't be there at all. I wonder if a sesame has ever won in a top competition? ... seems like there is a lot of opinions on what the definition of 'sesame' and how it relates to 'The Standard'. As far as the puppies ... I know that the parents and grandparents (both sides) range in color from light orange to deep red with a shade darker on the backs/tail/ears. The waiting is turning me into an obsessive 'Shiba/puppy researcher'!!!! @ Sarah_Jay12 ... Thanks! The photos from puppy to 10 months is helpful. Amazing how much they change!!! Maggie is a great looking girl - love her expressive eyes! Was she the puppy on the right? Not as dark as the beautiful sesame @Saya posted but guess you would call him a "lighter" sesame. At one point we thought he would loose all his dark markings but they became very distinguished at around six months. His dad looks more like @Saya's post while his Mom is a darker red. Sesame is more like Shikoku coloring. Very few Shibas are true sesame. There are only three recognized colors - red, sesame, and b&t. Reds may be called "dirty red" or "red sesame" if they have lots of dark hairs, but they are still reds. Sesame is difficult to breed for which is why you don't see whole litters of sesames being advertised. I'm pretty sure it's a recessive gene. It's way easier to get creams. @orangedoggie...in your opinion what would you call my Kobe based on the photos I included in my previous post? 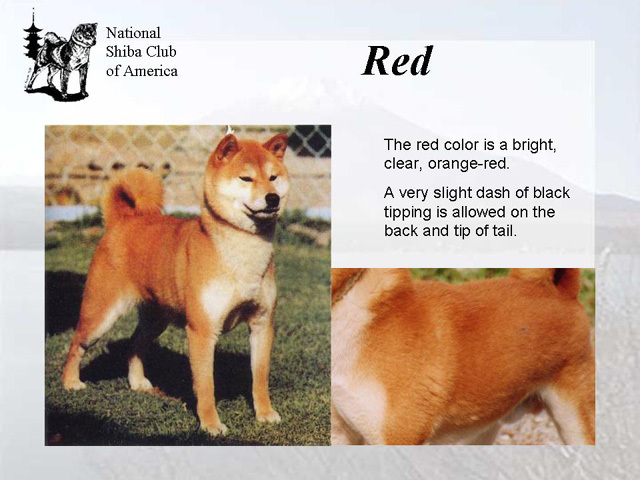 I did not see any mention of "dirty red" or even "red sesame" in the breed standard description. Just from what I can see, I'd say he's a red. He doesn't have the black extending up his head - the "widow's peak" on the two dogs I linked. The hairs are red with black tips and there shouldn't be a concentration of black in one area. See how the black is really evenly distributed on those dogs and how you can still see the bright red coat? I know it's really confusing, but when you see a real sesame, you can tell. I've only ever seen one in real life, and it wasn't even a particularly great example of one - not enough urajiro. It was still different enough that I knew immediately that it was a sesame. I see lots and lots of dirty reds - mainly with black areas on the back and tail. Breeding b&ts to reds can produce dirty reds. Some breeders who only like reds will never breed to a b&t or a red that has a b&t close up in a pedigree. There is nothing wrong with a dirty red except possibly in the show ring, and I've seen them win there. Some judges don't care, some do. Ok but if you read the breed standard description of a red it only allows for a very small area of black tips DOWN THE BACK. Kobe and many other "sesames"(?) have the black tips on the sides as well, most in distinct patterns. I was told by my breeder of thirty years that he is sesame...making me wonder if she's wrong!! 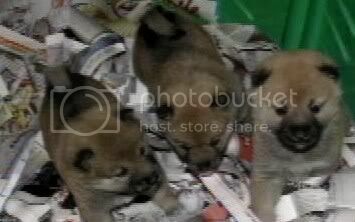 I'm agreeing with @orangedoggie - the pups in the pic are likely reds, not sesame. From what I've seen of sesame pups, they generally have a full dark face mask (including forehead), which none of these do (Take a look at @jellies and @Ethos's pics for example). The 2 on the left will likely be deep red, and the one on the right lighter. Though, the picture isn't very clear, and it could just be the light/shadows making the left 2 look darker. 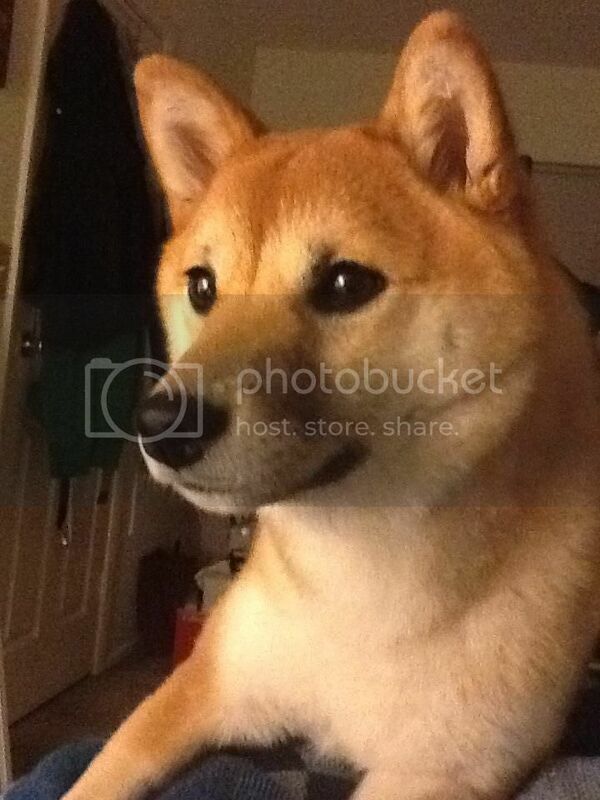 @Kobe1468, from the adult picture you posted, Kobe looks a lot like the dog shown in slide 51. 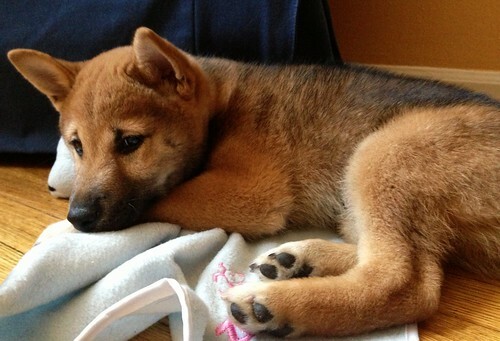 I swear in one of my magazines or a Japanese Shiba book it says that only 2% or so of Shibas are sesame - so really rare. I'll have to see if I can find it. 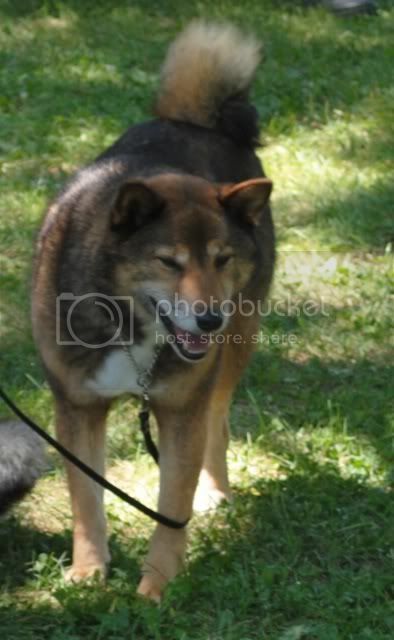 I once looked through a ton of pics from a Nippo show - like 600 Shibas - and saw one sesame. That judge seminar is great. Look at slides 49 and 50. @zandrame...not the best with technology, which one is slide 51?? Well this is all very disturbing!! According to the breed standard Kobe is not a red(too much black all over his body), nor is he a sesame(i guess)!! Would be interested to see what a breeder or show judge would say he is. Guess it really doesn't matter... I love my guy!! I'm going to do some more research on this, very interesting! @notoriousscrat....I would love to hear from a show judge to clarify this! 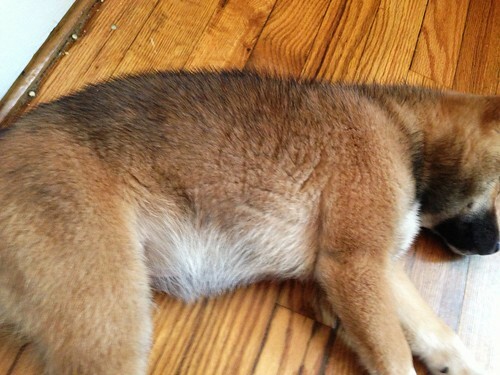 I'm not stating that Kobe is a show worthy shiba, but I do have an issue with calling him a "dirty red". If you look at the breed standard for a red it states that a brilliant orange/Red is preferred all over the body but a SLIGHT black tipping on the back and tail is acceptable. It says nothing about black tipping on the sides, nor a large concentration of black tipping. I understand that Kobe may not be a prime example of a sesame but he and others like him fit more into the Sesame standard than the Red. I'm just wondering why this is such an issue..to deny a dog Sesame status!! I agree, maybe not a prime example of a sesame but more so than a red. I guess I need to stick to my breeder of over 30 years experience! 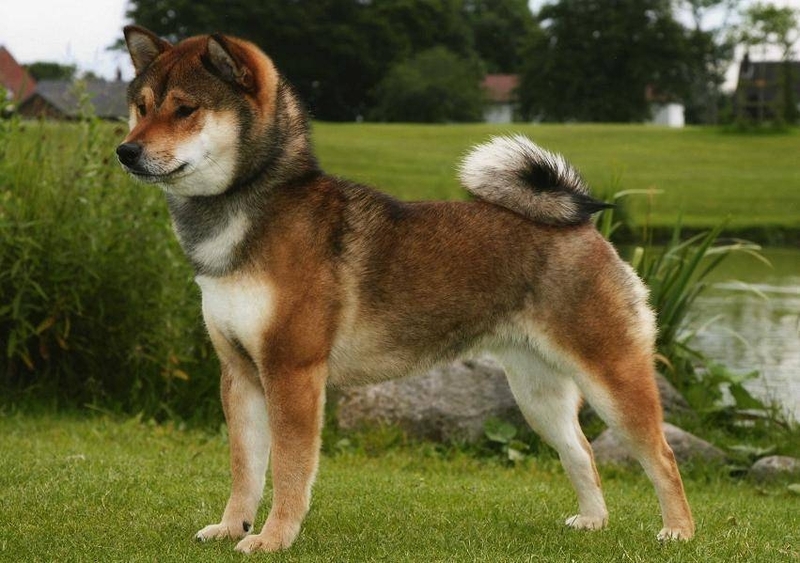 Imagine a black-and-tan Shiba. Now, in your mind, replace the solid black areas with a black-tipped red coat. The only exception to this similarity in pattern is that the tipping on a sesame can sometimes end at the forehead in a widow's peak leaving the bridge of the muzzle red, where on a black and tan the bridge must always be black. Sesames can be quite dark, up to 50% black but should not be any darker than this. The tipping must be even throughout the sesame areas with no concentration of black anywhere. Sesame is the rarest of the three preferred colors in both Japan and the US. At the Nippo National I attended in 1991, out of 652 Shibas entered only 3 were sesame. Many US breeders and judges have never seen a sesame! Many Shibas are sable rather than sesame. These dogs are red and have black-tipped hairs primarily on the back and tail only. 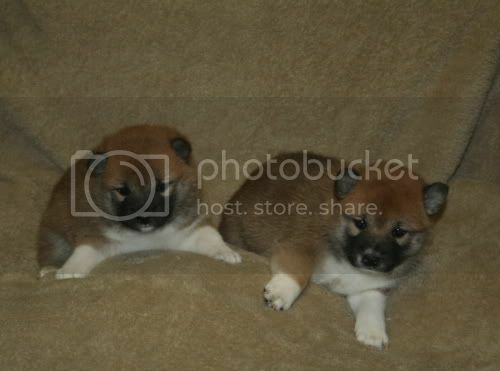 These sable Shibas are called "red with black inserts" in Japan. Nippo has no separate color category for registering sables. They are registered as reds. While dogs that have the sesame pattern and have quite a heavy overlay (keeping in mind the 50% rule), sables must have a sparse overlay. The closer to pure red the better. Under no circumstances should the overlay on a sable be so dark as to form a solid black saddle as in the German Shepherd. Adult sesames and sables must never have a black mask. If "dirty sesame" bothers you just refer to him as a red sesame. That is what he is, a little bit of both. Of course words like this never really bothered me...I have dirty blonde hair but that doesn't mean it is any worse than blonde, just different. I don't think it really matters, we aren't planning on showing our shibas anyways right? Re the pups - red or red sesasame (some black guard hairs on the back - especially for the one on the left but can't tell for the one on the right). I don't think these guys will be true sesame. @Mufasa - He is red sesame right now but a lot of that black might clear up...he is still really young (see Maggies photos above). He will probably have some black guard hairs fleck along his back though. I think all the pups in the 1st picture will end up Red. a lighter red for the one to the right. a Sesame pup is usually darker.. almost black. @Shibalove and @Sarah_Jay12....thanks! Sometimes I get defensive if I think someone is talking bad about my guy!! @Rikka, I hope the dun goofed comment is referring to my breeder calling him a sesame and not my dog!! @Mufasa...he's a very handsome guy!! This has been so interesting to read! I thought any Shiba that had black in it was a sesame. Apparently I was very wrong. And my dog is a red sesame and not sesame. I refuse to call her a red because in my opinion, if there is any black at all, the dog should not be characterized as a red. 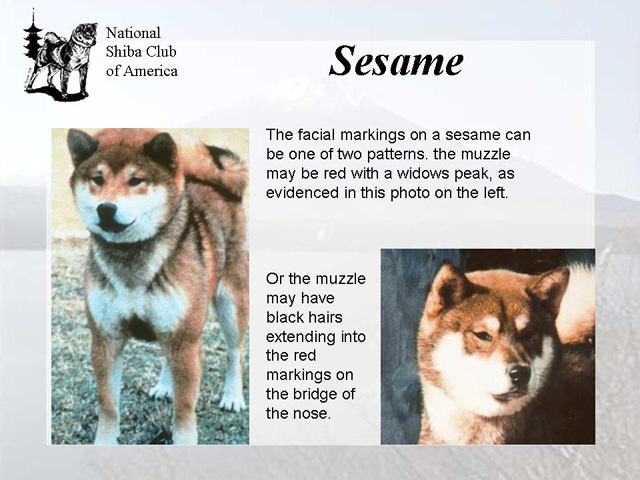 Just to add, the CKC does not require "sesame" Shibas to have the black guard hairs on head, it only states that they "may" have the black on head. 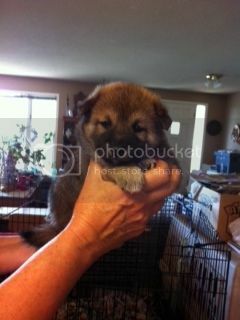 And since I'm in Canada as is my breeder, maybe this is why she considers him to be sesame?! He isn't a correct sesame, and he isn't a clear red. He may be a genetic sesame if a parent was Black and Tan or a correct sesame, but I would take the mismark approach, and just describe him as a mismarked red dog. 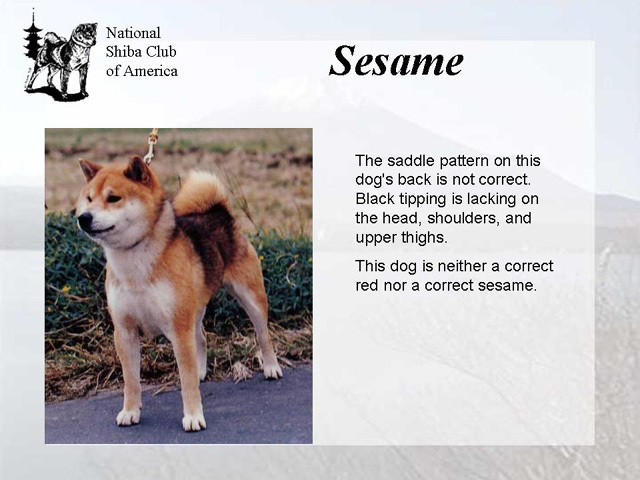 The Eukanuba best of breed winner last year was a sesame. Love this thread! I used to think any red shiba with black tips was a sesame but now I know better! I guess Taisho is a dirty red or red sesame. I don't know if he's got enough black tips to be called a red sesame though. As time goes on, we are seeing more black tips. I think being outdoors in the dirt, his tips were cut off and are slowly growing back. Either way, he's a dear and we're lucky to have him. As a prelude, let me just say when we are talking about standards, it does not mean that anybody's non-conforming pet is "inferior," just that they wouldn't be winning any competitions! And a note: sometimes the term "sesame" is used interchangeably with "red sesame," however they refer to the same standard of three colors (red, black and tan, sesame). There is no such thing as BOTH sesame and red-sesame. I've never researched the CKC standard, so I looked it up. Colour: Red, Sesame, Black and Tan. These are the only acceptable colours, and are to be given equal consideration. Red: light red to deep orange red. Sesame: red with black tipped hairs scattered evenly on body and sometimes head, with no concentration in any one area. A widow’s peak may be seen on the forehead, leaving the bridge and muzzle red. The description is brief, but it does affirm that sesame requires an even distribution of black hairs. The part about the head not always having black is elaborated in the next sentence, with a widow's peak and red muzzle (instead of mixed with black). This is the same as AKC. @amti...thank you!! So nice to hear!! Your Shibas are also beautiful!! I know there are only 3 standard coat colors but there are surely more non-standard coats like cream is never mentioned. Just because there isn't a standard for creams we would not refer to them as a mismarked red (or would we?) There are also pintos and minos. 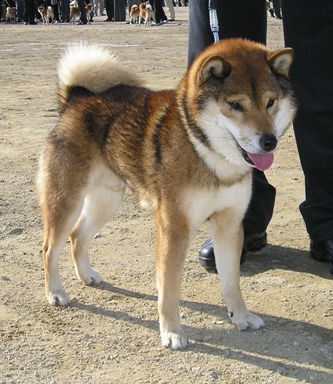 Mino is a type of Shiba (a seperate breed, really), whereas pinto is a coat pattern. Pinto is a mismark. Some cream coats are mismarked red (dilute). @zandrame where did you get those pictures and descriptions from? When I go to the NSCA website I can't find them..
Minos are such a deep red. Has anyone had hands on one? I'm curious what color undercoat they have. Well this has been a very interesting discussion!! Several very strong opinions on the subject!! I have spoken to several people up here, mainly Shiba owners, and they are all split on the issue!! The most recent comment I got was a response to a email I sent to a show judge from my local kennel club. She considers Kobe to be sesame and would judge him to that standard. I have no intent to show Kobe, as I know he's not a exceptional example of his breed, and I got him as a companion anyway...but just adds to the wide array of opinions on this! I do trust my breeder and do not feel mislead by her calling him a sesame. 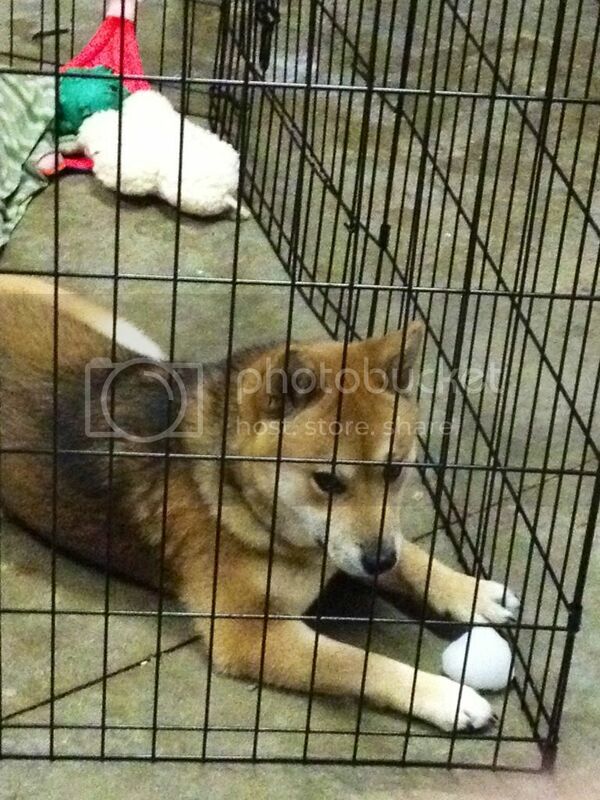 I think her involvement in the Shiba club, her local kennel club, her show record(which is impressive! 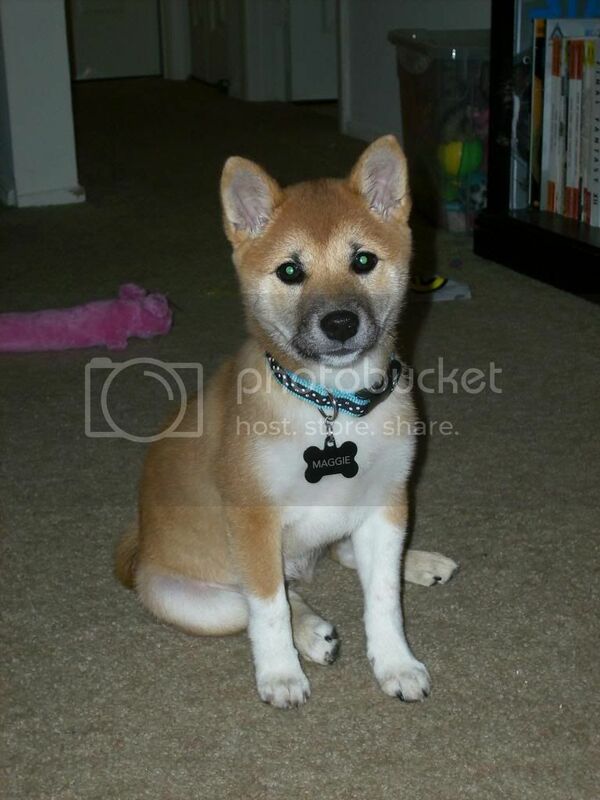 ), and her commitment to producing healthy, well tempered and socialized Shibas and Sibes speaks for itself! I respect her opinion without question. I would like to thank you all for ringing in on this! So much passion here!! And I hope some of my comments didn't take this thread too of topic??!! Sorry about that!! Breeders don't really take the best pictures or color correct or anything. I'd suggest you don't get too hung up on color so early in your pup's life. Cute pups Tallygroup. Nice coloring and no socks. That is one thing about my pup she has socks on her front paws and they are not even. So here is my sesame more red than black but we think she is getting more dark gard hairs. She is constantly changing. Her head is quite red and though I find her face quite pretty it is her head that keeps her from the show ring more than anything else. She still hasa lot of puppy coat. It has been kind of fun to see the fur around her neck become more full and go over her collar. When she was younger she looked more like Mufasa's pup. Sorry it is just my profile picture. It was when she was four and a half months. Still having trouble posting pictures. 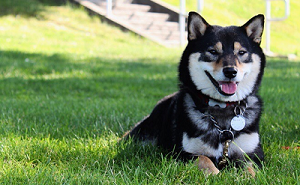 I did ask a breeder for their opinion on her and I guess she has many faults so the next time someone oohs and aahs over her I will have to let them know she is an ugly Shiba Inu mutt. Not properly bred because she doesn't have the right common grandparent or come from an accepted breeder. Wow does that sound stupid and harsh. I edited this because well I didn't need to go on. Stupid and harsh makes the point. @Tre26... Nobody has said that non-conforming dogs are ugly or make bad pets. I'm assuming you are carrying over some frustration from the spot-the-puppy-mill threads, but that is not the focus of this one. Granted, haphazard breeding will lead to more unpredictable colors and markings, let alone health issues. But further discussion on that is better suited to those original threads. Multiple people, including myself, have told you how to post pictures. Please check your intro thread. You cannot upload photos to the forum directly (only the profile picture). You must use an external host (like flickr or photobucket) and copy the links into your post. But from your profile pic, it looks like Mazda is red. @Tre26... Please don't feel hurt! This discussion was started only for fun to get opinions from owners on what the 'prediction of color' was going to be in the pups. It then turned into a lesson/debate on the 'Definition According to Standard' for a 'Sesame'. In no way will this thread factor in on my decision or opinion of my future pup. Every dog belonging to the owners on this forum are so very lucky to have such passionate people - and therefor the dogs are probably the most wonderful animals/companions - which truly makes a beautiful dog!